That moment when the olive green Cinema Oxide case was placed by my desk will never be forgotten. What could be in there? Will this be life changing? What does all this mean? Long story short, by opening that case my life has changed drastically. I find myself thinking as a parent does for their child. However, my child’s name is a bit out of the norm. MoVI M10 has a nice ring, don’t you think? Like any relationship, there are highs and lows. The M10 and I have shared all of these moments from the early headaches at the shop to the winter sunset walks along the Charles River. As our relationship has grown over the past few months, I have learned to appreciate MoVI for what it can do for the entire production community. It is a true game-changer that provides new opportunities and ease. I have mentioned how easy the unit is to use, but I want you to take that with a grain of salt. There is a lot of time and effort that one needs to invest in order to initially understand how the M10 works and functions. It’s not as simple as taking it out of the box and starting to shoot right away. There are a few steps to remember in order to get optimal operation from the M10. Before any balancing starts to happen, you always want to make sure that your camera is completely built up. Have your lens, follow focus, transmitter, cables, etc., all squared away. Even the weight of the lens cap will make a difference. Once the M10 is powered on, you want to refrain from adding or subtracting any weight. Adding and subtracting weight will throw the balance off, thus resulting in the motors working harder than necessary. Once the camera is set, it’s time to start the balancing procedures. Pan, Tilt, and Roll will be your favorite three words after spending some time with the M10. These are the three axes that the M10 works upon. Your balancing will be done in conjunction with these motors and functions. At this point your camera is attached to the sled, and you are making fine adjustments to get your perfect balance. When you first start balancing the M10, you’ll want to channel all of your patience and take deep breaths. Sometimes the littlest adjustments will make all of the difference in a negative or positive way. Once you have spent enough time with the balancing process, it will start to become natural. Soon enough, you will have no problem swapping from a built-up Epic to a Blackmagic Pocket Camera. Well, what are you waiting for? Now is the time to experience the M10 and introduce it as part of your next production. 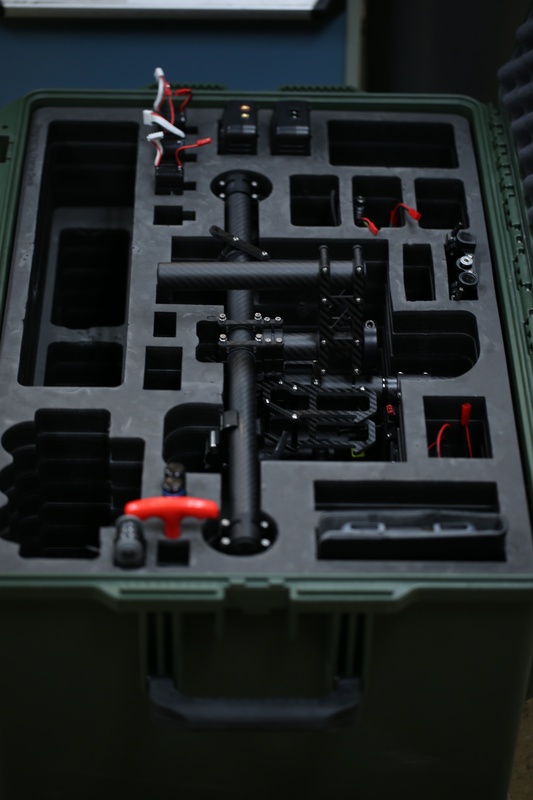 Just remember to take the time and learn the ways of the MoVI before you get on set. This extra prep time will save you from a headache and a frustrated Director. 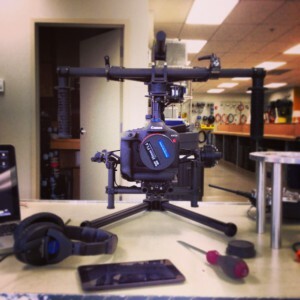 Now Is The Time for The MoVI M10! -Dylan Law, QC Tech, law@rule.com JOIN RBC’S MIKE SUTTON AND DYLAN LAW FOR AN INTRO TO THE MOVI M10 LEARNING LAB ON WED., 2/26 FROM 10AM-12N. RSVP: EVENTS@RULE.COM. 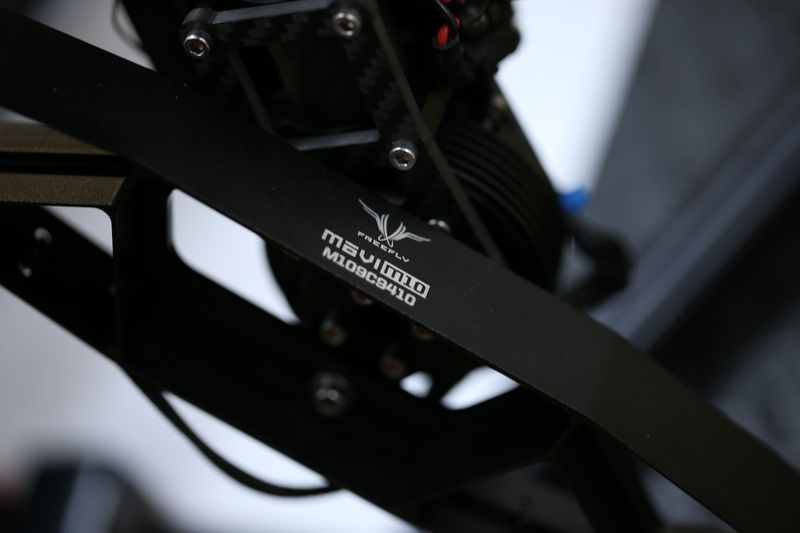 The buzz of excitement around the MoVI M10 by Freefly Systems is something for the record books. Every website is featuring articles on the M10, and test footage is being posted daily. I haven’t seen anything like it since the RED One was launched at NAB back in 2007. This three-axis brushless gimbal system really is a game changer in my opinion. After working with the unit for some time, I have gotten over the “hype” and started to realize the practicality of the unit and how it may start to change the way we think of putting a project together. 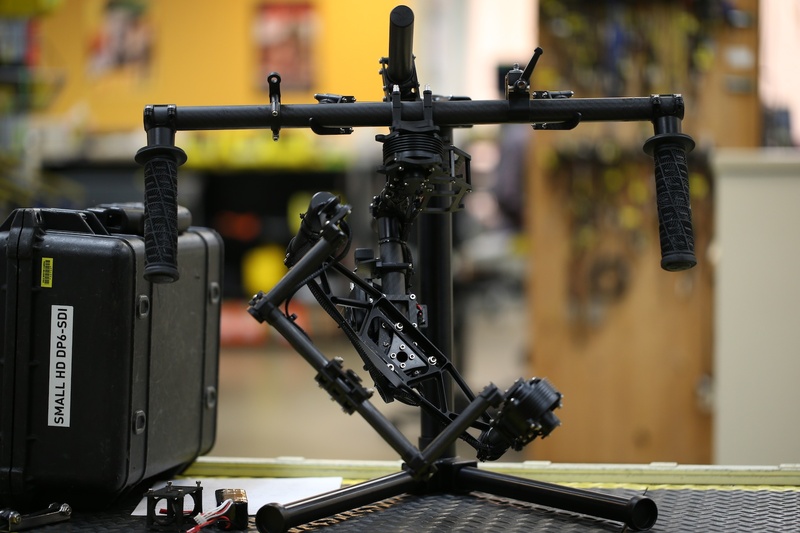 Dolly Track, Operators, Jibs, Cranes, and much more won’t be a thing of the past, but, if one is working on a budget, there is a solution now that will help to cut down on all of these costs. Sure, it may cost a nice chunk of change to buy, but renting the M10 is a great option. Less bodies and gear on set has never been a bad thing. One MoVI Operator, One Focus Puller, One Remote Control Operator and a Director sounds like a great production day. It’s that simple, and you can create a look that would take days of pre-production and hours of assembly on set to achieve. When you go to playback that first shot, trust me, you will be blown away at what you just captured in such a minimal manner. After seeing what was possible with the M10, it was time to push it to the limits. Why not run with it at full speed and see what happens? Well, what happened was a shot that was so unbelievably smooth, I had to watch it three times! The footage was so much better than I expected. Then we received the Ninja Star Adapter. 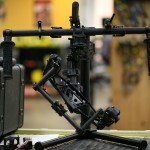 At that point, I hadn’t heard much about what this would open up in terms of shooting with the MoVI. Boom!!! I grabbed the Porta-Jib and attached the MoVI to the Jib in an under-slung fashion, and it was time to rock. The results were hands-down the most responsive Remote Head I have ever worked with. Oh, and just to remind you all…it was Smoooooth!! The ten-pound load capacity that the M10 offers may scare one away at first. Fear not, you can achieve a very high level of production while using the unit for your project. 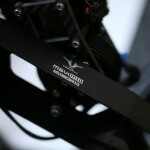 Are you looking to work with the RED Epic? Consider it a done deal and with accessories. Let’s use a Wireless Follow Focus System with that Zeiss Superspeed, and, of course, you want to transmit to a Wireless Monitor as well. All of these high-level production needs are possible with just a bit of tinkering and patience. Oh, you say that you work with the Canon 5D MIII, Black Magic Cinema Camera, FS700, Canon C300, or C100? Not a problem in the least bit. 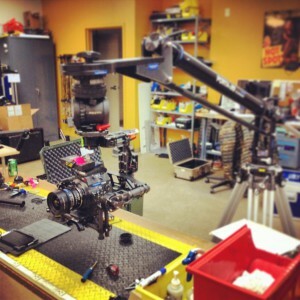 All of these cameras will pair just perfectly with the MoVI M10, and the footage will be oh so smooooth!!!! 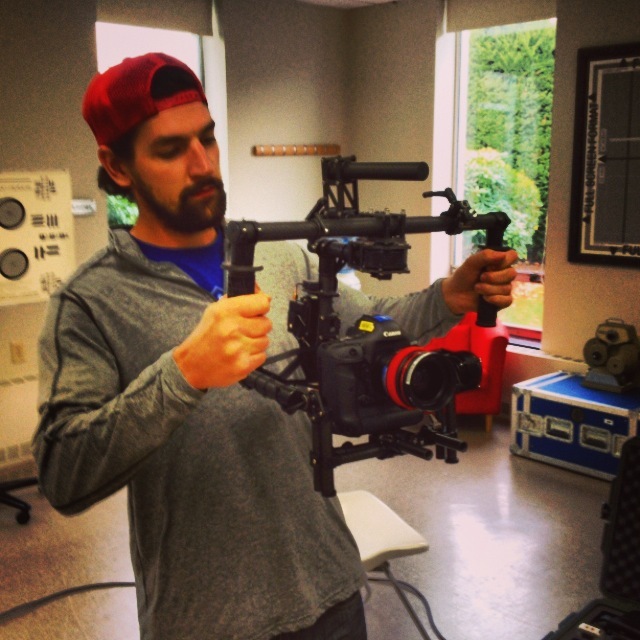 -Dylan Law, QC Tech, law@rule.com JOIN RBC’S MIKE SUTTON AND DYLAN LAW FOR AN INTRO TO THE MOVI M10 LEARNING LAB ON WED., 2/26 FROM 10AM-12N. RSVP: EVENTS@RULE.COM.